FRP duct rodder may not be a professional construction staff do not know it very much, in fact, it is also known as the leader, literally, it is a machine that can draw some lines, but also some people want to know more. You can look at The next introduction, I hope for your help. Like all tools, FRP duct rodder also have some usage requirements and proper methods of use. It is important to know that the effort is not wasted to get to the right place. The same applies to FRP duct rodder. First of all, is the temperature problem, a lot of appliances are relatively sensitive to temperature, the average glass fiber threader temperature is between 40 degrees to 80 degrees, not too high or too low, otherwise it will cause it Destruction, the impact of the use of the future. And then, that is, it’s a huge traction role, once destroyed will not be able to use, therefore, must be carefully protected. In fact, any small part should also be protected, a broken parts affect the entire project process, I hope we can pay attention. Finally, due to the material requirements of the FRP duct rodder itself, it has a range of bearing pressure, etc., so it can not be used blindly when it is used. The maximum traction force is 2.5 tons, it must not exceed, protect . 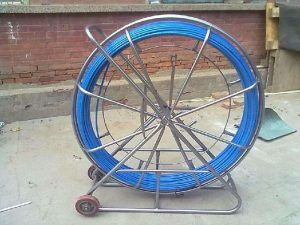 Grasp the use of the above glass fiber duct rodder, I believe you can rest assured that the use of our company’s fiberglass threading device is reliable, and fiberglass duct rodder equipment quality, you are welcome to contact us.